NOTE: In keeping with the tradition of Killer Klowns, my Kommentary will be Kluttered with K’s replacing C’s. Kheers! One of the truly kult klassics of kontemporary kinema, “Killer Klowns” is a b-movie you laugh with, not at. Well, except for the Kotton Kandy pods, the dialogue or John Allen Nelson. This isn’t meant to scare you like “Texas Khainsaw Massacre” or make you think (I guess) like “Glen or Glenda”; it’s meant to be fun. The brothers Chiodo- er, Khiodo, who kreated this film, aren’t taking the movie too seriously, so why should we? “Klowns” starts with a klassic kliche- an interstellar something-or-other touches down in some nondescript kollege town, and two horny kids, Mike (Grant Cramer) and Debbie (Suzanne Snyder), decide to check it out. They sneak inside the tent and instantly notice that there’s no circus here- the tent is just headquarters for a band of murderous klowns who shoot people with lasers and turn them into kotton kandy pods! One of the klowns khases them out of the tent with his evil popkorn gun, but they manage to get to safety. The original leads for “48 Hours”? Luckily Debbie’s ex-boyfriend Dave (the inkomparable John Allen Nelson) is a kop, and they race to the police station to get his help. But krotchety old Mooney (John Vernon), the other kop on duty, thinks their story is a dumb hoax, and refuses to help. This means Dave is on his own against the klowns. By this point the klowns have left the tent and walked into town. (A road sign in the walking scene says town is five miles away, but the Klowns make it to town walking before Mike and Debbie do racing around in their kar!) 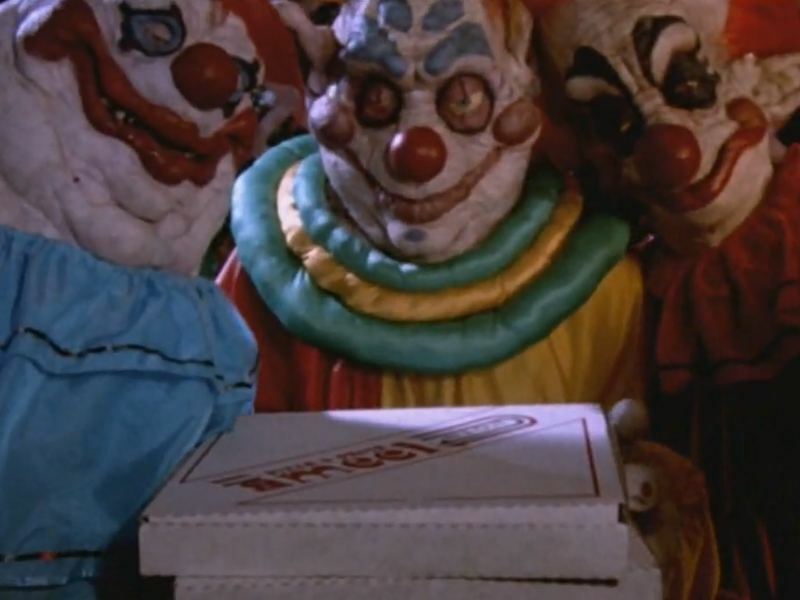 They do all sorts of malevolent klown things- they pretend to deliver pizza to one lady, but when they open the pizza box, there’s a gun-totin’ klown inside. They get people at a bus stop to watch shadow puppets, but then use the puppets to eat them. And two of the klowns go shopping at the Woolworth’s, shooting shaving cream at each other and bludgeoning all the other customers. From here, it’s a khase scene through all sorts of goofy klown motifs, as Dave and the three stooges find Debbie, free her from her balloon prison, and try to escape from the klowns. Dave is our hero, as he not only distracts the klowns so the others can escape, but then defeats the biggest klown in a death struggle by poking his nose with the pin on his police badge. The klowns all blow up, the town is saved, and just so everybody can laugh at the end, someone hits our stars in the faces with pies. Aside from the atrocious dialogue- people are konstantly saying what we kan already see, like â€œthis looks strangeâ€ and â€œlook at thisâ€ and â€œwe better go this wayâ€ and â€œhe’s goneâ€- and the odd fact that the klowns talk just like Jawas, this is one of the most entertaining, enjoyable b-movies I’ve seen in a long, long time. A true klassic.